Conveniently located in Manheim, Spooky Nook Sports is recognized as the largest indoor sports complex in the United States. While we’re proud of that distinction, we’re just as proud of our versatile meeting room spaces that can accommodate a variety of event types. They had everything we needed right on site. The meeting rooms, break out space, team building events, hotel and restaurant. 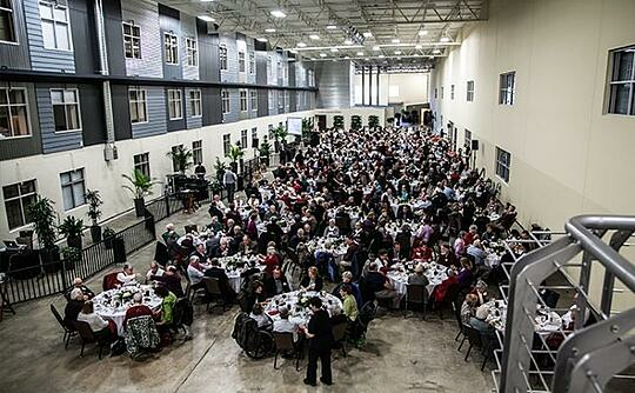 When you visit our expansive facility, you’ll see that we have 700,000 square feet of meeting spaces that is able to accommodate up to 10,000 guests during a single event. Our location is conveniently located near Harrisburg, Hershey, Lebanon, and Lancaster, PA. Whether thousands of people are scheduled to attend your event or you’re planning an intimate board meeting for 10 or fewer individuals, our meeting rooms spaces can be customized to accommodate your group. We’ll set up the meeting spaces you rent the way you want so your guests will be comfortable throughout your meeting. If your meeting is going to include a presentation, we’ll make sure everyone will have a great view of the stage or presentation area. We’ll also make arrangements with our vendors to ensure you have the audio, visual and lighting equipment necessary for your presentation to have the greatest impact possible. With our meeting spaces having been the location for countless business and private get-togethers already, we know that hunger and thirst can distract people from the information you want them to take away from your meeting. That’s why we offer a wide variety of catering options when you book our meeting room spaces. Our talented executive chef and banquet staff have experience helping clients put together menus that will impress their guests and we’ll be happy to help you do the same. Whether you want a buffet, a plated meal or an assortment of snacks that will keep your guests satisfied throughout your meeting, we’ll use fresh and local ingredients to prepare the food we’ll serve. While we have plenty of fitness activities at our location, you may not know that we also have a restaurant and a hotel on our campus. These amenities make our meeting spaces an even better choice if you’re planning a meeting that will span several days or your meeting is part of a larger, multi-day event such as a trade show. When you dine at the Forklift & Palate, you’ll enjoy traditional American fare with a modern twist. And when you stay at The Warehouse Hotel, you can choose your accommodations from 135 rooms and suites that were designed with guest comfort top-of-mind. Contact Spooky Nook Sports to learn more about our flexible meeting room spaces in Manheim, PA today.